On Saturday we return to the Halton Stadium, the home of Widnes FC, for the first time since January 2015. 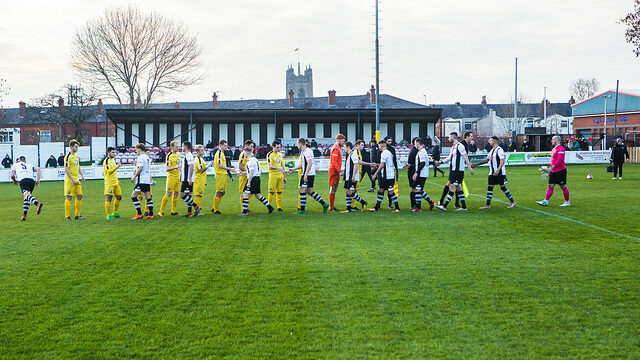 Widnes were promoted from the North-West Counties last season after finishing in 2nd place in the Premier Division and started this season playing their home games at Barnton’s Townfield ground. Joint managers Steve Akrigg and former Colls man Kev Towey took over the reins last season following Joey Dunn’s shock resignation, both continuing their playing careers whilst managing. The Whites have had a solid start debut season in the Evo-stik league and sit firmly in mid-table, currently in a decent run of form which saw them beat Ramsbottom away at the start of March and last weekend they were only edged out by a late Lloyd Dean goal away to Prescot Cables having taken the lead in the first half. Earlier in the season, The Whites came away from Atherton with all three points, the game coming down to two penalties, Colls missing theirs whilst Ben Hodkinson slotted home for the visitors. Our last visit to the Halton Stadium saw Colls run out 5-0 victors, with King of the Colls Mark Battersby scoring in the first minute. We antiscipate for far closer game tomorrow! Colls are back at home on Monday when Newcastle Town are the vistors.